I have been a little busy these past few days. Kitty and the children are sick, some with tonsillitis, some with the flu. I have taken a couple of days off work do more around the house and look after the family. Due to this I have had little time to work on my property, but for maintaining the animals and the fodder. Today I had a little time this afternoon so I decided I had better prune back some of the trees in my orchid. Some of them have grown branches in directions that do not suit my plans (such as growing over a pathway, or towards the fence). I also needed to cut some of the suckers that had grown from the root stocks. After I cut the branches I thought that it was a waste that they would be tossed on the compost or the ground. 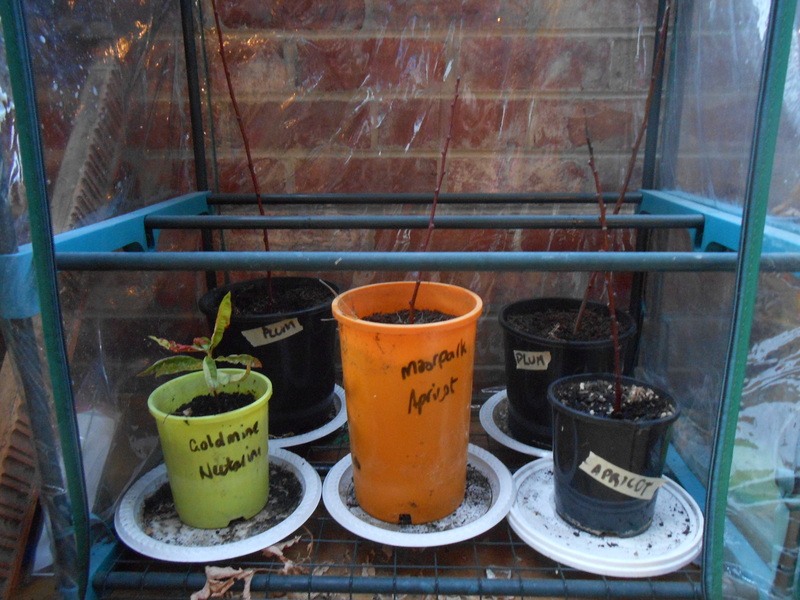 I decided that I might have a try at propagating the branches. I had last successfully tried this about 20 years ago so I guess it was time to try again. Yes, the branches are small… yet they say size doesn’t matter. I selected five of the nicest branches, one nectarine, two apricot and two plum. After dampening the end of the branch I dipped it into a packet of Yates branch powder and then placed them into pot of soil. The soil was a combination of soil from the garden and some compost from my compost pile (I will have to write about the pile soon. Sorry for the delay). I placed the pots in one of my mini greenhouses. I will have to water then nearly every day, yet I expect that they should begin to form roots soon. 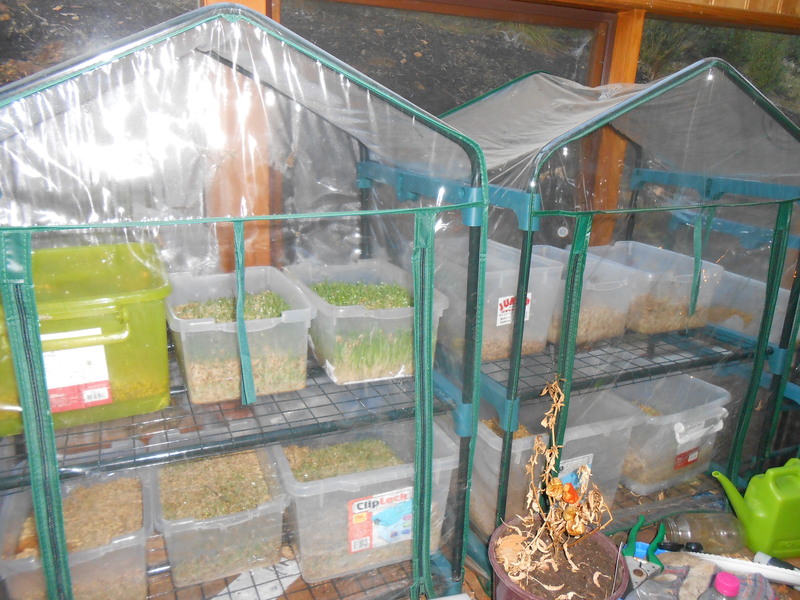 On a slightly related note (related as this is to do with my mini greenhouses), my fodder growing system is close to being complete. By complete, I mean I have all the wrinkles ironed out and I have enough fodder to feed my rabbits every day (rather than topping up with some pellets). Here is a picture of a dozen trays, with another three to be added to make the system complete. Please forgive the sorry excuse for a pepper in front of the greenhouses… I was attempting to get it to grow to seed and I have placed it there to remind me to check the pods.